Beginning in the 1890s, William Nicholson created posters with his brother-in-law James Pryde, using the pseudonym J. & W. Beggarstaff. In 1897, Nicholson produced a woodcut print of Queen Victoria that was very well received and helped establish his reputation with the British public. About that same time Nicholson cut a series of wood blocks of An Illustrated Alphabet for publisher William Heinemann. Originally issued in a very small run of hand colored woodcuts, their popularity led to the images being transferred to lithographic stones and printed in a bound volume. This was soon followed by two other similar series of images, An Almanac of Twelve Sports and London Types. Nicholson’s style is instantly recognizable, with the broad strokes from his original woodcuts printed with subtle variations of earth tones, harking back to earlier British chap book illustrations. After the turn of the century, Nicholson turned more to painting, though he did continue to produce illustrations for several books. The prints from his three bound plates volumes offer a wonderful sample of Nicholson’s vision and also of British culture at the end of the nineteenth century. 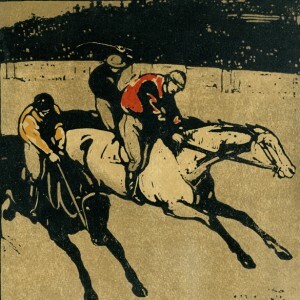 William Nicholson’s woodblock prints of the 1890’s were amongst the most revolutionary British print images of the era. They used a treatment of form, with a stylised simplification of shape, and a handling of perspective and picture space which had had no precedent in British art. Influences of Japanese art, and a parallel thinking to, if not a direct knowledge of, the ideas of Toulouse Lautrec and of the Nabis painters in Paris at the same period can certainly be felt, although there is no record that Nicholson had actually studied either at this date.